Decoration 5 miniatures in colours and gold, with full (f. 4) or partial borders decorated with foliate and interlace patterns, at the beginning of each book (ff. 4, 91v, 167, 229v, 251). Foliate initials in colours and gold at the ebginning of each book. 'Champ' initials in gold on blue and rose grounds with penwork decoration in white. Initials in red with pen-flourished decoration in purple or blue, or in blue with pen-flourished decoration in red. Line-fillers in brown ink highlighted in yellow. Binding Post-1600. Royal Library binding of brown leather with the arms of George II and a date of 1757. Provenance The text dedicated to the University of Paris (f. 4). John Batayle, a canon of St Bartholomew's at Smithfield, mentioned among other canons in a clerical subsidy roll of 1379 and named in a will of 1382, made by John Chyshull, another canon of St Bartholomew's (see Bovey 2002), probably illuminated for him: the Batayle arms (ff. 3v, 4r, 43v, 47v, 65v, 66r, 75v, 90v, 178v, 179v 180). The Augustinian priory of St Bartholomew's at Smithfield: inscribed, 'Liber domus sancti barthomomei in smyth fylde', 15th century (f. 1v). The Old Royal Library (the English Royal Library): Henrician title 'Decretales' and Westminster inventory number 'no. 1059' (f. 1), acquired by the Upper Library at Westminster after the inventory of 1542; in the catalogue of 1666, Royal Appendix 71, f. 9v; and in the 1698 catalogue of the library of St James's Palace (see [Edward Bernard], Catalogi librorum manuscriptorum Angliae et Hiberniae (Oxford: Sheldonian, '1697', but 1698? ), no. 8377, 8378, 8380, or 8388). Part I: the text and gloss written in Southern France, perhaps in Toulouse: lemmata underlined in yellow, with the decoration left unfinished. Catchwords and bifolium signatures; numerous corrections. Part II: the Calendarium illuminated and added on a separate quire at the beginning of the manuscript (ff. 1v-3v); marginal decoration and scenes in the lower margins added by a different artist, probably on the request of John Batayle, a canon of St Bartholomew's at Smithfield (his arms: see provenance) (see Bovey 2000 and 2002). Select bibliography J.R. Green, Short History of the English People (London, 1893), passim. J. J. Jusserand, English Wayfaring Life in the Middle Ages (London, 1899), passim. J. A. Herbert, Illuminated Manuscripts (London: Methuen, 1911), p. 230. R. S. Loomis, 'A Phantom Tale of Female Ingratitude', Modern Philology, 14 (1916/1917), 751-55. George F. Warner and Julius P. Gilson, Catalogue of Western Manuscripts in the Old Royal and King’s Collections, 4 vols (London: British Museum, 1921), I, p. 334. Otto Pächt, 'A Giottesque Episode in English Illumination', Journal of the Warburg and Courtauld Institutes 6 (1943), 51-70 (p. 55). Joan Evans, English Art 1307-1461, Oxford History of English Art, 5 (Oxford: The Clarendon Press, 1949), pp. 33, 41 n. 3. Margaret Rickert, Painting in Britain: the Middle Ages (London: Penguin, 1954), pp. 118, 124. K. Varty, ‘Reynard the Fox and the Smithfield Decretals’, Journal of the Warburg and Courtauld Institues, 26 (1963), 347-54. Medieval Libraries of Great Britain: A List of Surviving Books, ed. by N. R. Ker, 2nd edn, Royal Historical Society Guides and Handbooks, 3 (London: Royal Historical Society, 1964), p. 123. Virginia Wylie Egbert, The Mediaeval Artist at Work (Princeton: Princeton University Press, 1967), pp. 66, 68, pls 23, 24. Janet Backhouse, 'Manuscript Sources for the History of Mediaeval Costume', Costume: Journal of the Costume Society, 1 (1968), 9-14 (p. 12). W. B. Yapp, 'The Birds of English Medieval Manuscripts', Journal of Medieval History, 5 (1979) 315-48 (p. 335). Peter Murray Jones, Medieval Medical Miniatures (London: British Library, 1984), pp. 62-63, figs 23-24. Gerhard Schmidt, ''Belehrender' und 'befreinder' Humor: Ein Versuch über die Funktionen des Komischen in der bildenden Kinst des Mittelalters', in Worüber Lacht das Publikum im Theater? Spass und betroffenheit Einst und Heute: Festschrift zum 90. Geburtstag von Heinz Kindermann, ed. by M. Dietrich (Vienna: Herman Böhlaus, 1984), pp. 9-39 (p. 25, n. 47, il. 21). Lucy Freeman Sandler, Gothic Manuscripts 1285-1385, 2 vols, A Survey of Manuscripts Illuminated in the British Isles, 5 (London: Harvey Miller, 1986), I, no. 101. The Age of Chivalry: Art in Plantagent England 1200-1400, ed. by Jonathan Alexander and Paul Binski (London: Royal Academy of Arts, 1987), p. 382, fig. 130 [exhibition catalogue]. Ewa Sniezynska-Stolot, 'Christian Interpretation of the Zodiac in Medieval Psalters', Umeni, 37 (1989), 97-111 (pp. 107, n. 33, 109). L. L. Brownrigg, 'The Taymouth Hours and the Romance of Beves of Hampton', English Manuscript Studies, 1100-1700, 1 (London: British Library, 1989), 222-41 (p. 223). Michelle P. Brown, A Guide to Western Historical Scripts from Antiquity to 1600 (London: British Library, 1990), pl. 48. Alison Stones, review of 'Sandler, Lucy Freeman, Gothic Manuscripts 1285-1385, 1: Text and Illustrations, 2: Catalogue', Speculum, 66 (1991) 691-94 (p. 693). Michael Camille, Image on the Edge: The Margins of Medieval Art (London: Reaktion, 1992), pl. 83. Janet Backhouse, The Illuminated Page: Ten Centuries of Manuscript Painting in the British Library (Toronto: University of Toronto Press, 1997), no. 98. Lucy Freeman Sandler, 'Pictorial and Verbal Play in the Margins: The Case of British Library, Stowe MS 49', in Illuminating the Book: Makers and Interpreters, ed. by Michelle P. Brown and Scot McKendrick (London: British Library, 1998), pp. 52-68 (fig. 20). Alixe Bovey, 'Didactic Distractions Framing the Law: British Library Royal MS 10 E IV' (Unpublished doctoral thesis, University of London, Courtauld Institute, 2000). The Libraries of King Henry VIII, ed. by J. P. Carley, Corpus of British Medieval Library Catalogues, 7 (London: The British Library, 2000), H2.1059. Susan L’Engle and Robert Gibbs, Illuminating the Law: Legal Manuscripts in Cambridge Collections (London : Harvey Miller, 2001), p. 94. A. Taylor, Textual Situations: Three Medieval Manuscripts and their Readers (Philadelphia: University of Pennsylvania Press, 2002), pp. 137-96. Alixe Bovey, 'A Pictorial Ex Libris in the Smithfield Decretals: John Batayle, Canon of St Bartholomew's, and his Illuminated Law Book', in Decoration and Illustration in Medieval English Manuscripts, English Manuscript Studies 1100-1700, 10 (London: British Library, 2002), pp. 67-91. Alixe Bovey, Monsters and Grotesques in Medieval Manuscripts (London: British Library, 2002), pp. 56-57, pls 48-49. Jessica Brantley, 'Images of the Vernacular in the Taymouth Hours', in Decoration and Illustration in Medieval English Manuscripts, English Manuscript Studies 1100-1700, 10 (London: British Library, 2002), pp. 83-113 (p. 85). Hilary M. Carey, 'What is the Folded Almanac? The Form and Function of a Key Manuscript Source for Astro-medical Practice in Later Medieval England', Social History of Medicine, 16 (2003), 481-509 (p. 493). Justin Clegg, The Medieval Church in Manuscripts (London: British Library, 2003), p. 53, pl. 44. Peter Kidd, Review of 'Decoration and Illustration in Medieval English Manuscripts', English Manuscript Studies 1100-1700, 10 (London: British Library, 2002), in The Library, 7th series, 4 (2003), pp. 304-306. Pamela Porter, Courtly Love in Medieval Manuscripts (London: British Library, 2003), pp. 9, 44. The Cambridge Illuminations: Ten Centuries of Book Production in the Medieval West, ed. By Paul Binski and Stella Panayotova (London: Harvey Miller, 2005), p. 138. Peter Murray Jones, 'Image, Word, and Medicine in the Middle Ages', in Visualising Medieval Medicine and Natural History, 1200-1550, ed. By Jean A. Givens, Karen M. Reeds, and Alain Touwaide, AVISTA Studies in the History of Medieval Technology, Science, and Art, 5 (Aldershot: Ashgate, 2006), pp. 1-24 (p. 9 n. 13). 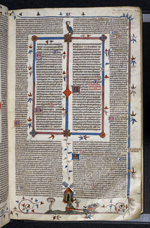 Michelle P. Brown, The Holkham Bible: A Facsimile (London, British Library, 2007), p. 16, pl. 16. Deirdre Jackson, Marvellous to Behold: Miracles in Medieval Manuscripts (London: British Library, 2007), pls 39, 40. Elizabeth Morrison, Beasts: Factual & Fantastic (Los Angeles: J. Paul Getty Museum, 2007), p. 61. Joe Flatman, Ships and Shipping in Medieval Manuscripts (London: British Library, 2009), pl. 72. Scot MacKendrick, John Lowdem, and Kathleen Doyle, Royal Manuscripts: The Genius of Illumination (London: British Library, 2011), no. 108 [exhibition catalogue]. Borders with figures and birds, capital 'D's, text.